Topics: Collections, Tutti- Frutti Rings, In Stock, Engagement Rings, Remodelling, and Bespoke Designs. 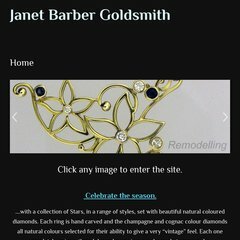 Janetbarber.com's server IP number is 83.138.175.185. It has 2 DNS records, ns1125.hostgator.com, and ns1126.hostgator.com. It is hosted by Digital-method-ltd Ip Space England, using Microsoft-IIS/6 web server. PING (83.138.175.185) 56(84) bytes of data.